As Saints, we do the best we can to live by our Benedictine Values: Respect, Stewardship, Community, Hospitality, and Love of Learning. Volunteering combines all five of these values to create a well-rounded person. Where could you use your talents and gifts? Think of all the ways you could act within the Duluth community and beyond! These local organizations have requested CSS Student Volunteers! Including Aftenro Home, Animal Allies, Courage Kenny Rehabilitation, Damiano, Lake Superior Zoo, Lifehouse, Local Hospitals, and many more! 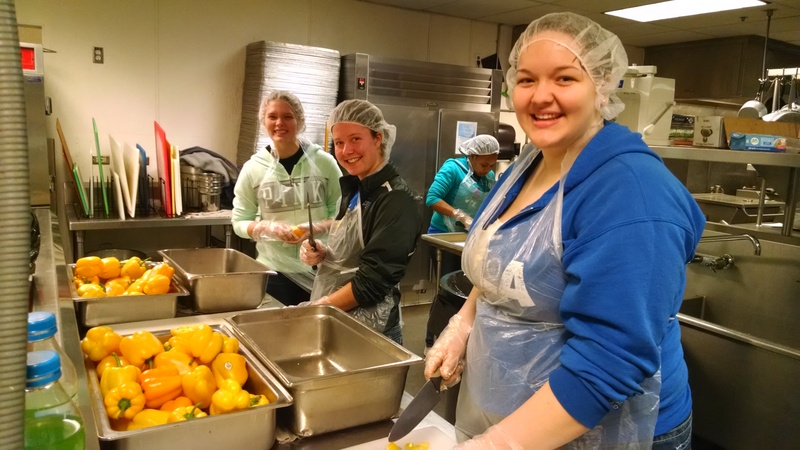 Volunteering full-time for a year (or so) may be a great option for you to take a gap year after your time at St. Scholastica. These organizations have requested CSS Volunteers. Stop by the Campus Ministry Center (Tower 20) and pickup a free 'Response' magazine that lists a wide variety of faith-based volunteer programs, including those in the United States and international sites. Feel free to contact Jessica Ellingson or Nathan Langer in the Campus Ministry Center (Tower 20) if you want to talk about post college volunteering options. Are you hoping to connect to CSS Students or Graduates? If so, please complete THIS FORM to reach out to us. You may be able to come to campus to table and/or be added to our lists of organizations on this page. Contact Lori Barnstorf with any questions.